Real Estate Corner: Selling? Disclose, Disclose, Disclose! Home > Blog > Real Estate > Real Estate Corner: Selling? Disclose, Disclose, Disclose! Arizona law requires a home seller to disclose any known material facts about the property that could impact its value or a buyer’s decision to move forward with the purchase. 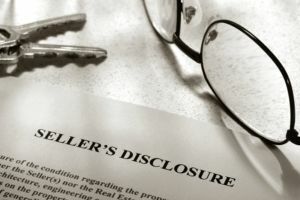 The Arizona Association of REALTORS has created a form known as the Seller’s Property Disclosure Statement (SPDS) to assist homeowners in making these disclosures. Sellers are instructed to answer all of the questions as truthfully and fully as possible and to provide supporting documentation when applicable. It is due to the potential buyer within three days of contract acceptance. Some sellers are hesitant to disclose information for fear that the buyer won’t continue with the sale. However, it is always in the best interest of the seller to be forthright and honest about the condition of the property. “Failure to disclose” accounts for a high percentage of lawsuits filed by real estate buyers, so it behooves the homeowner to state all material facts up-front. The type of information that is asked on the SPDS form includes knowledge of the structural integrity of the property such as roofing issues, presence of termites, and problems with systems such as heating, cooling and electrical. The seller is also asked to disclose any knowledge of scorpions, bee swarms, or rodents having ever been present on the property. Knowledge of mold, lead paint, radon, asbestos, underground storage tanks, soil expansion, noise including those from airports or traffic, or any other nuisances are also to be reported. If the seller does not have personal knowledge of an issue, there is an area on the form to state as such. Again, this law requires sellers to disclose known facts. Further, the seller’s real estate agent or attorney are not permitted to answer these questions for the homeowner but are available to explain the questions if needed. Sellers will find that disclosing pertinent information saves a lot of time and hassle during the escrow process and goes a long way in avoiding any future litigation.